Padmé Addresses the Senate is a scene where Padmé is arguing against the creation of an army for the Republic. She is met with resistance from the Senate and Palpatine. For a breakdown of the scene, pictures, and a video clip Click here. 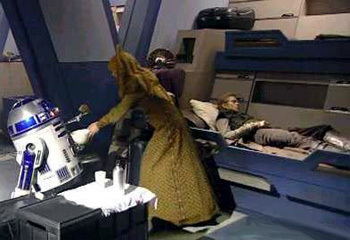 Anakin's Dream on the Refugee Freighter is a scene where Anakin is having a bad dream about his Mother on the journey from Coruscant to Naboo. For a breakdown of the scene, Click here. The Dark Side is a scene where Mace Windu and Yoda are talking about the Sith and the growing of the Dark Side. For a breakdown of the scene, Click here.